A few weeks ago, we held our very first Mini MakerFaire at my school. Our Makerspace is still in it’s infancy (it’s really just a bunch of tables set up in the middle of the library) but I wanted to have an event that would raise awareness of what we are doing among students and parents. I put together a group of students who were interested in promoting what we’re doing, and together we planned this event. We held it in conjunction with our parent conference night, which meant that we had quite a few families come through during the evening. We broke the different activities up into stations, and each student volunteered to head up a different one. 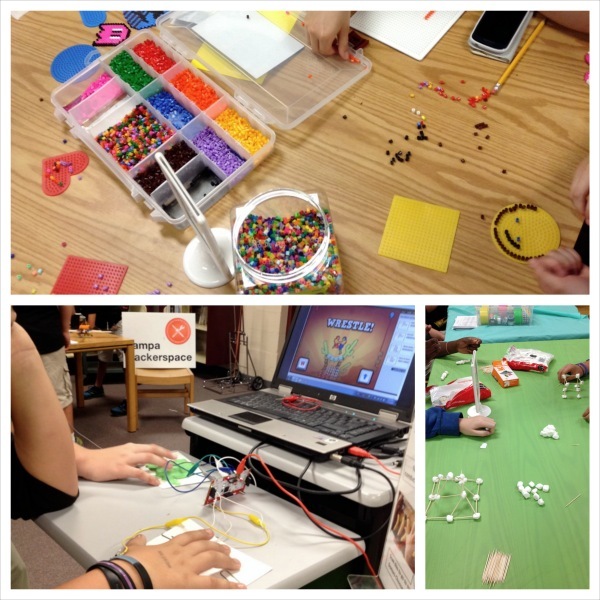 Our stations included: marshmallow engineering, duct tape wallets, Snap Circuits, Perler bead art, K’nex rocket building and MaKeyMaKey games. The MaKeyMaKey was very popular. I let one of my students tinker with it the week before, and he spent a lot of time tinkering with different materials and games to figure out cool things to do with it. We changed it up throughout the night. The most popular was a two player Starwhals setup. This is currently the most popular game at my school, and students were drawn in by seeing it projected up on the big screen. They were delighted to find that everything was being controlled by tapping playdoh. We also set up a paper clip piano and a pencil drawn Flappy Bird throughout the night. 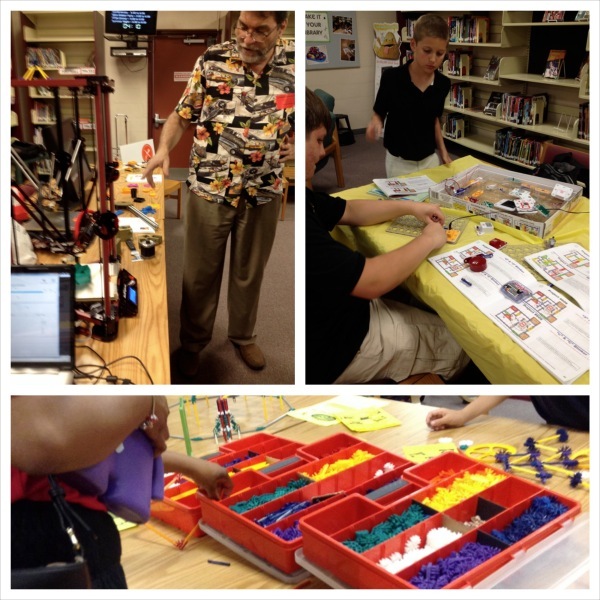 We had a booth with our special guests from Tampa Hackerspace, who brought along a 3D printer and several robots. This was by far one of the most popular stations. Students and parents alike were fascinated by the 3D printer. Steve and Bill were happy to talk to the kids about how the 3D printing process works, what it’s like to design in TinkerCad, how to set up a Raspberry Pi, etc. Bill let the kids control one of the robots with their phones, and they had so much fun moving him around and bumping him into their friends. 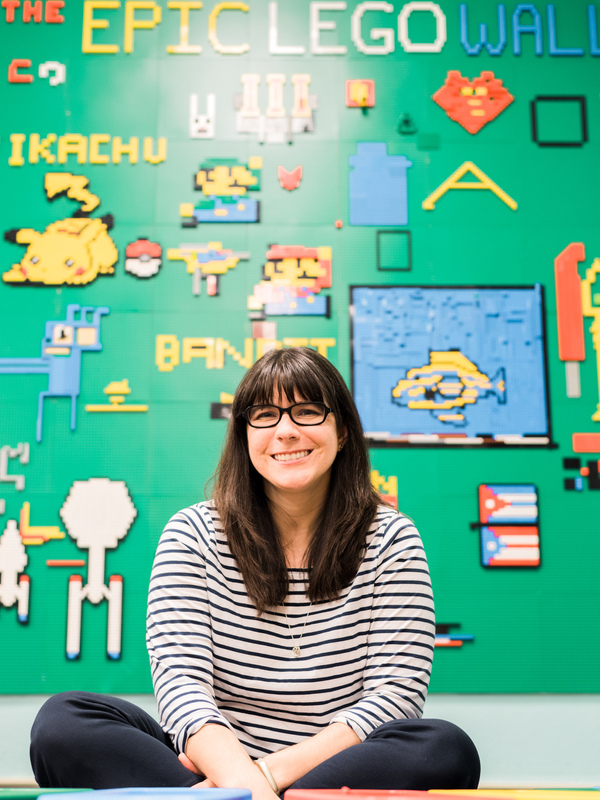 I’m so happy to be building this connection with Tampa Hackerspace, and I look forward to finding more ways for us to partner. We also used this event as a mini-fundraiser to help us add to our Makerspace, so we created mini-science kits that students could purchase for $1 and take home. 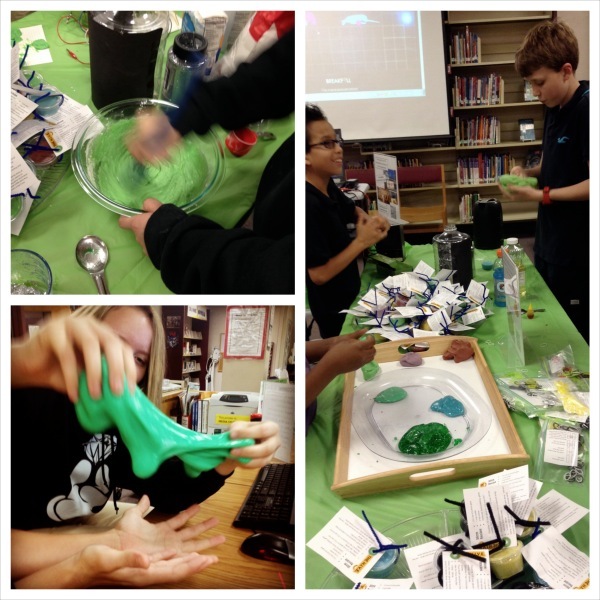 We had slime and playdoh kits, which contained samples as well as recipes for how to make them at home. Throughout the night, we held science demonstrations where my students helped me show our guests how to make playdoh and slime. It was so much fun, and I still have kids coming in everyday asking to buy some slime. All in all, I would say that this event was a rousing success! We had at least 70 students and parents come through during the event, and everyone had positive things to say about it. 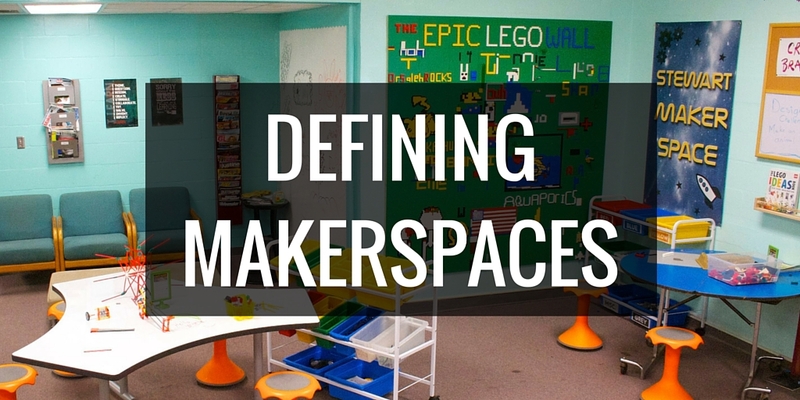 A few months ago, no one had any idea what I was talking about when I said I wanted to create a Makerspace in our library. Now it’s becoming a reality, and it’s awesome.